Kayaking a small pond in Barrington, New Hampshire. Sunset. Where: Round Pond, Barrington, New Hampshire. It’s located on a 1500 acre parcel of woods and wetlands adjacent to Stonehouse Pond, a popular fishing and climbing location. When: 8:30 p.m., last Friday night. About ten minutes after sunset. 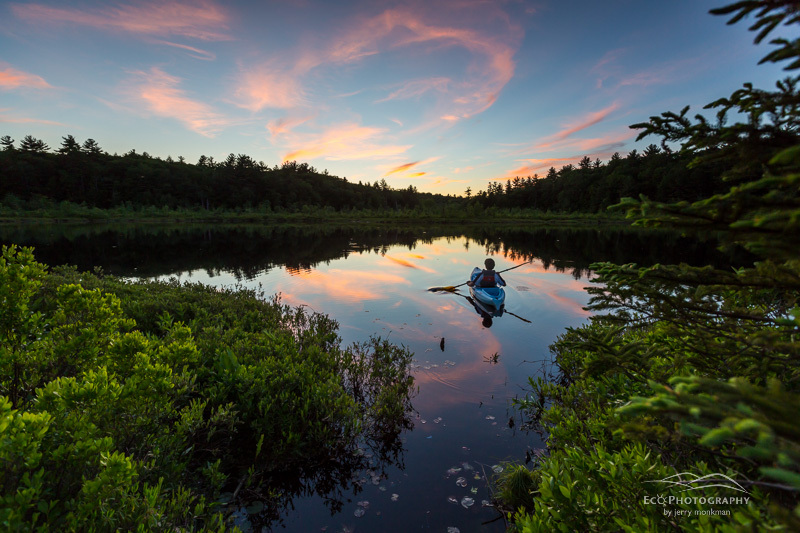 Who: That’s me in the boat, and I was shooting for The Southeast Land Trust of New Hampshire (SELT). How: I’ve visited this pond several times since October and I knew that given some nice clouds it would be a good spot for sunset, so being there for this kind of light was part of the plan (luckily it worked out!) The shot itself is fairly straightforward – I used a Canon 16-35mm F 2.8 lens at 16mm on a Canon 5D MarkIII, mounted on an Induro tripod. The pond is actually pretty small, so by using the wide angle perspective I was able to exaggerate its size. I used a 3-stop graduated split neutral density filter to be able to keep detail in both my sky and the foliage in the foreground. Since I was alone, I attached a CamRanger to the camera so I could control it from my iPhone while out in the pond. By taking some sample shots, I determined about where I wanted to be and then set the camera to remotely fire the shutter every second while I paddled around. I pre-focused the camera on that little stump sticking out of the water behind my kayak and with the wide angle lens I figured I’d have enough depth of field at F5.6 to keep me in focus as well. Using ISO 400, I needed a shutter speed of 1/30 second which is a little slower than I usually like for shots of moving things, so I paddled very slowly or not at all for a few minutes and managed several sharp frames. For post-processing, I used Adobe Lightroom to make some basic tonal corrections, primarily increasing the light in the shadows, which brought out more green in the foreground foliage. The distant trees are darker because of the grad filter, but I kind of like how that darkness adds a little mystery to the scene. I also bumped up the vibrance (+25) and saturation (+10) a bit. Why: Last fall, SELT entered an agreement to purchase and conserve this property and they asked me to do some photography that they can use in their efforts to raise the $3.3 million purchase price. Here’s a little info from their website: “Situated less than 5 miles from the busy junction of Routes 4 and 125 in coastal New Hampshire, 1,500 acres has remained undeveloped and wooded, sheltering bogs and fens, black gum swamps, beaver wetlands, and babbling brooks. This extraordinarily large tract of land in the Town of Barrington is the latest and largest land conservation project ever pursued by SELT.” While rich in wildlife habitat, the forest itself for the most part lacks the dramatic views I often seek out in my photography, despite the fact that I feel some of that drama while exploring this place. By photographing Round Pond in this colorful light and with the wide angle perspective, I’m able to bring some of that drama to my growing collection of imagery from this landscape. Please post any questions you might have in the comments section below.